Fig. 9.1-2. Transverse section of stem of a cactus (Matucana grandiflora, no common name). Mucilage cells are common in many cacti and are believed to be adaptive by helping the cacti to retain water: the slimy mucilage (a carbohydrate, stained red here) binds to water and prevents it from evaporating. The mucilage is produced by dictyosomes, packaged into dictyosome vesicles, transported to the exterior of the protoplast and deposited outside the cell when the vesicles fuse with the plasma membrane (this is a form of granulocrine secretion). 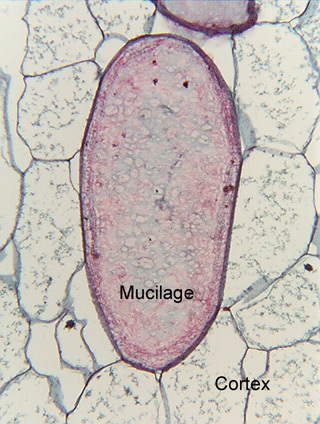 The mucilage cell -- like virtually all secretory cells -- is a parenchyma cell, and even though it has only a thin primary wall, the wall is compact enough to prevent the mucilage from leaking out into the intercellular spaces. As the mucilage accumulates, the protoplast must shrink – there is only a limited amount of volume enclosed by the cell wall. Ultimately, the protoplast shrinks to virtually nothing and dies, then the entire volume becomes filled with mucilage. This type of mucilage cell is fairly common in many plant families (southerners will be familiar with okra [Hibiscus esculentus] which is very slimy if not cooked properly), and has been studied by electron microscopy (see Botanical Gazette 141: 374-378 (1980)).